From the earliest years of European settlement in North America, whites enslaved and oppressed black people. Although the Civil War finally brought about the abolition of slavery, a harsh system of white supremacy persisted thereafter. In the early twentieth century, African Americans in the South and in many parts of nearby border states were banned from associating with whites in a host of institutions and public accommodations—schools, hospitals, old folks’ homes, rest rooms, waiting rooms, railroad cars, hotels, restaurants, lunch counters, parks and beaches, swimming pools, libraries, concert halls, and movie theaters. Some recreational areas posted signs, "Negroes and Dogs Not Allowed." Racial discrimination deprived Southern blacks of decent jobs and schools and of elementary rights of citizenship, including voting. White intimidation and violence, including lynching, remained an ever-present threat. Outside of the South, blacks had legal rights, but they suffered from widespread discrimination and from de facto residential and school segregation. Black and white liberal reformers struggled to ameliorate these oppressive practices, forming groups like the NAACP in 1909 and the National Urban League in 1911. South Carolina’s Septima Clark established Citizenship Schools for civil rights across the South, and North Carolina’s Ella Baker worked to improve conditions in the South. Their efforts remind us that civil rights activism has a considerable history predating the 1940s and that it featured largely unsung grassroots workers. The 1940s brought renewed efforts, however. In 1941, A. Philip Randolph threatened to stage an all-black March on Washington unless President Franklin D. Roosevelt acted to end racial discrimination in employment and racial segregation of the armed forces. Roosevelt agreed to a Fair Employment Practices Committee (FEPC) to investigate employment practices. Although the FEPC had no real power, Randolph’s highly visible advocacy of large-scale, direct-action protest was a sign of militant tactics to come. Other developments of the war years promoted pressure for civil rights. One was massive movement of black Americans out of the rural South in order to take defense-related jobs in northern and western cities. This migration continued in the 1950s and 1960s, and greatly increased black voting strength and the potential for black community organization. Black soldiers, serving abroad in World War II, witnessed a less oppressive world of race relations than they had known in the South. Many returned home determined to fight racism. After the war, civil rights advocates welcomed further signs of liberal change. President Harry S. Truman, waging a Cold War against Communism, recognized that racism at home contradicted American claims to lead the "free world" against oppression. Hoping to woo black votes in the 1948 election, Truman ordered the desegregation of the armed forces and called for federal laws to advance civil rights. Congress rejected his appeals for legislation, but Truman’s moves were noteworthy: No American president since Reconstruction had made such an effort. Activists operated on the local, grassroots level as well, pressing for an end to school segregation. These bold protestors risked not only their jobs but also their lives. Homes and churches were burned, and attempts were made to kill African American organizers. Often the goal was equality between black and white schools, rather than racial integration, for many blacks were anxious to maintain their own black-run schools. By 1950, the NAACP’s Legal Defense and Educational Fund, led by Thurgood Marshall, decided to battle racial segregation through the courts. The Fund’s efforts led to the landmark 1954 ruling in Brown v. Board of Education of Topeka. Marshall exclaimed after the decision, "I was so happy I was numb." Many historians have identified the Brown case as the pivotal moment in the history of American race relations and the beginning of a broad civil rights movement that escalated in the 1960s. In December 1955, grassroots activists in Montgomery, Alabama—NAACP members E. D. Nixon and Rosa Parks chief among them—sparked what soon became a large-scale boycott of buses and of white-owned businesses in Montgomery. The boycott began after a white bus driver had Parks arrested for refusing to obey rules that required blacks to move to the back of buses when no seats were available for whites. The Montgomery movement catapulted the Reverend Martin Luther King Jr. to leadership in the Civil Rights Movement. By 1957, King had created his Southern Christian Leadership Conference (SCLC) to carry on the struggle. Two visible developments in 1957 also encouraged advocates of civil rights. One was passage of a Civil Rights Act, the first to be approved by Congress since Reconstruction. It created a Civil Rights Division within the Department of Justice as well as a federal Civil Rights Commission that was authorized to investigate racial problems and recommend solutions. The other was President Dwight D. Eisenhower’s decision, arrived at reluctantly, to send federal troops to Little Rock, Arkansas, in order to establish order and enforce a token desegregation plan admitting nine black students to the city’s all-white Central High School. Yet segregated social patterns did not vanish. The Court’s ruling that "all deliberate speed" should be used to enforce the Brown decision offered little guidance to federal courts in the South and encouraged white opponents of desegregation to develop delaying tactics. In 1964, ten years after Brown, only one percent of southern black children attended public schools with whites. Escalating white violence in the South disheartened proponents of racial justice during the 1950s. Many black people, especially young people, became impatient with the slow process of legal cases. To them, the federal government was both remote and unhelpful, and organizations like the NAACP seemed too legalistic and conservative. Local people, they decided, must take direct action to change racial patterns in their communities. Beginning in February 1960, with the Greensboro, North Carolina, sit-ins at the Woolworth lunch counter, the sit-in tactics spread like wildfire throughout the South. These tactics initiated the most powerful phase of America’s Civil Rights Movement, which peaked over the next five tumultuous years. The restless young people had been essentially correct: Direct-action protest, especially if it provoked violence by white extremists, was the most productive means of civil rights activity. The shift in tactics revived older civil rights organizations like the Congress of Racial Equality (CORE) and prompted the formation of new ones such as the Student Nonviolent Coordinating Committee (SNCC), all dedicated to direct action such as sit-ins and demonstrations. By May 1961, the first interracial freedom rides from Washington, DC, to New Orleans were underway, designed to force southern officials to honor a recent Supreme Court decision that had called for the ending of racial segregation in interstate bus terminals. Violence quickly followed, as one bus was firebombed in Alabama and its riders were injured. The Kennedy administration sent federal marshals to Alabama to restore order, but the bloodshed did not end until the governor, anxious to rid his state of both the freedom riders and the federal marshals, brought in state troops to end the fighting. Attorney General Robert Kennedy then struck a deal with Mississippi officials that resulted in the riders being arrested (without violence) in Jackson, the next stop. These bloody confrontations attracted considerable public attention. They also revealed that the Kennedy administration, concerned mainly with Cold War issues, was reluctant to jeopardize its political strength among whites in the South and southerners in the Congress. Kennedy was slow to recognize the moral passion of civil rights demonstrators or to employ force in order to stem the implacable resistance and rage of many southern white people, police, and politicians. It took two deaths and almost 400 injuries at Ole Miss before Kennedy sent in federal marshals to end the violence on the campus. In early 1963, Martin Luther King Jr. organized protests in Birmingham, Alabama. Eugene "Bull" Connor, the local police chief, ordered his men to fire blasts of water against demonstrators and unleashed vicious dogs on the resisters. Television captured a host of striking scenes, some of them showing assaults and arrests of black children, and relayed those images to a stunned national audience. As a result, many northerners became aware of the plight of African Americans in the South. As much as any single event in the history of the modern Civil Rights Movement, the violence of whites in Birmingham forced the American people to consider serious federal action promoting civil rights. In June 1963, following Alabama Governor George Wallace’s show of resistance to desegregation of the state university, Kennedy addressed a national television audience to call for a federal civil rights law, which would mainly prohibit racial segregation in public accommodations. Only a few hours later, the widely respected Mississippi NAACP activist Medgar Evers was killed. When Kennedy was assassinated in November, his civil rights bill seemed stalled on Capitol Hill. But Lyndon Johnson of Texas, who succeeded Kennedy in the White House, proved to be both a masterful strategist and a dedicated champion of a strong bill. In June 1964, President Johnson signed into law a bill that not only included a job-discrimination title but also authorized creation of a new agency, the Equal Employment Opportunity Commission (EEOC). 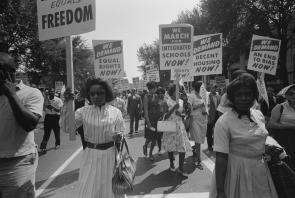 Though school segregation remained pervasive until the early 1970s, the Civil Rights Act of 1964 was a landmark measure by any standard, ending segregation in a host of public accommodations. Civil rights activists now turned to voting rights as a goal. Their Freedom Summer in Mississippi brought some 700 volunteers to the state to promote citizenship-training workshops and voter registration. When two white workers, Michael Schwerner and Andrew Goodman, and one black volunteer, James Chaney, were killed, the FBI reluctantly infiltrated the Ku Klux Klan and ultimately cracked the case. The focus on voting rights in Selma, Alabama, led to further attacks on civil rights activists in 1965. The violence against the men and women who joined the fifty-mile march from Selma to the state capital of Montgomery was widely televised and President Johnson won increased support for strong reforms. That August, Congress passed the Voting Rights Act. A high point of the Civil Rights Movement, the law supplemented the Civil Rights Act of 1964 and further guaranteed black legal equality. Passage of the law also encouraged Johnson, King, and other advocates to think seriously about tackling other pressing issues—notably of social and economic inequality—that badly divided Americans along racial lines. But support for federal social programs did not prove as strong as Johnson had hoped. By 1965, the Civil Rights Movement was growing fragmented, less interracial, and less committed to nonviolence. Only five days after LBJ signed the Voting Rights Act, looting and burning began in the black neighborhood of Los Angeles known as Watts. Other urban riots followed. These outbreaks exposed the rage of blacks outside the South, but many Americans were appalled by them, blaming them on lawless radicals and revolutionaries. Equally harmful to the movement was its rapid splintering along racial lines. In 1966, black militants, led by Stokely Carmichael, advanced calls for Black Power. "The only way we gonna stop them white men from whippin’ us," Carmichael insisted, "is to take over." Carmichael and others soon forced whites from positions of responsibility in CORE and SNCC. They also distanced themselves from the emphasis on nonviolence that King had championed. New groups, notably the Black Panthers, adopted militaristic poses that alarmed whites. Other blacks, including members of the Nation of Islam, rejected integration entirely. The decline of interracialism and the turn away from strict adherence to nonviolence cost CORE and SNCC dearly: No longer did they hold high moral ground. White financial support for these groups, which had been vital, dried up. By 1968, both organizations had collapsed. The Vietnam War also damaged the political coalition that had enabled the President to secure a host of other landmark legislative victories—Medicare, Medicaid, and federal aid to public education among them—in 1965. Political conservatives, who had been routed by LBJ in the election of 1964, grew increasingly powerful by 1968. The assassination of Martin Luther King Jr. on April 4, 1968, was another significant blow to the Civil Rights Movement. Assessing the movement is difficult. It produced unexpected policies, such as the establishment of affirmative action, especially in the areas of employment and higher education admissions. It benefited blacks in other ways, too. As they acquired confidence in their ability to organize and to effect political change, they gained greater pride in their cultural strengths and accomplishments, notably (but not only) in the fields of music, dance, film, and sports. The work of black artists, such as photographer Gordon Parks, painter Jacob Lawrence, the Alvin Ailey American Dance Theater, and novelist Toni Morrison, received widespread notice and critical praise. In popular culture—films, television shows, ads—ugly stereotyping of black people and black culture became far less widespread. The movement also helped to increase the numbers and percentages of African Americans in middle-class jobs, and the armed forces took steps to end discriminatory recruitment and promotion procedures and to develop integrated forces. Yet the Civil Rights Movement did not achieve as much as dreamers had hoped for in the mid-1960s. The desegregation of schools, which moved ahead in the 1970s and 1980s, has fallen back, and gaps in educational test scores between black and white students, always high, have widened. In the early 2000s, rates of poverty and unemployment among African Americans remain roughly twice as high as those of whites. For a variety of reasons, including relatively low levels of access to health care, the longevity of African Americans is less than that of whites. Black median income is approximately 70 percent of white income; black median wealth is a tiny fraction of white wealth. Many black inner-city areas feature very high rates of students dropping out of high school, violent crime, out-of-wedlock pregnancy, family breakups, and drug addiction. Rates of arrests and imprisonment of African American men far exceed those of white men. And the Civil Rights Movement, still suffering from the blows that afflicted it in the late 1960s, lacks power. In 1965, Martin Luther King Jr. and Lyndon Johnson hoped that America, having rallied around effective civil rights acts that promoted legal equality, could move on to tackle serious social and economic inequality—but in the early twenty-first century, that goal still seems out of reach. James T. Patterson is the Ford Foundation Professor of history emeritus at Brown University and the author of Grand Expectations: The United States, 1945–1974 (1997) and Debating the Civil Rights Movement, 1945–1968 (2006). Jonas, Gilbert. Freedom’s Sword: The NAACP and the Struggle against Racism in America, 1909–1969. New York: Routledge, 2005. Parris, Guichard, and Lester Brooks. Blacks in the City: A History of the National Urban League. Boston: Little, Brown, 1971. Weiss, Nancy J. The National Urban League, 1910–1940. New York: Oxford University Press, 1974. McMahon, Kevin J. Reconsidering Roosevelt on Race: How the Presidency Paved the Road to Brown. Chicago: University of Chicago Press, 2004. Pfeffer, Paula F. A. Philip Randolph, Pioneer of the Civil Rights Movement. Baton Rouge: Louisiana State University Press, 1990. Ball, Howard. A Defiant Life: Thurgood Marshall and the Persistence of Racism in America. New York: Crown Publishers, 1998. Burk, Robert Fredrick. The Eisenhower Administration and Black Civil Rights. Knoxville: University of Tennessee Press, 1984. Brinkley, Douglas. Rosa Parks. New York: Viking, 2000. Garrow, David J. Bearing the Cross: Martin Luther King, Jr., and the Southern Christian Leadership Conference. New York: W. Morrow, 1986. Kohl, Herbert R. She Would Not Be Moved: How We Tell the Story of Rosa Parks and the Montgomery Bus Boycott. New York: New Press, 2005. Peake, Thomas R. Keeping the Dream Alive: A History of the Southern Christian Leadership Conference from King to the Nineteen Eighties. New York: P. Lang, 1987. Carson, Clayborne. In Struggle: SNCC and the Black Awakening of the 1960s. Cambridge, MA: Harvard University Press, 1995. Greenberg, Cheryl Lynn, ed. A Circle of Trust: Remembering SNCC. New Brunswick, NJ: Rutgers University Press, 1998. Meier, August, and Elliott Rudwick. CORE: A Study in the Civil Rights Movement, 1942–1968. Urbana: University of Illinois Press, 1975. Wolff, Miles. Lunch at the Five and Ten, The Greensboro Sit-Ins: A Contemporary History. New York: Stein and Day, 1970. Zinn, Howard. SNCC: The New Abolitionists. Cambridge, MA: South End Press, 2002. Brauer, Carl M. John F. Kennedy and the Second Reconstruction. New York: Columbia University Press, 1977. Niven, David. The Politics of Injustice: The Kennedys, the Freedom Rides, and the Electoral Consequences of a Moral Compromise. Knoxville: University of Tennessee Press, 2003. Ball, Howard. Murder in Mississippi: United States v. Price and the Struggle for Civil Rights. Lawrence: University Press of Kansas, 2004. Cagin, Seth, and Philip Dray. We Are Not Afraid: The Story of Goodman, Schwerner, and Chaney and the Civil Rights Campaign for Mississippi. New York: Macmillan Pub. Co., 1988. Morris, Willie. The Ghosts of Medgar Evers: A Tale of Race, Murder, Mississippi, and Hollywood. New York: Random House, 1998. Nossiter, Adam. Of Long Memory: Mississippi and the Murder of Medgar Evers. Reading, MA: Addison-Wesley, 1994. Kotz, Nick. Judgment Days: Lyndon Baines Johnson, Martin Luther King, Jr., and the Laws That Changed America. Boston: Houghton Mifflin, 2005. Loevy, Robert D., ed. The Civil Rights Act of 1964: The Passage of the Law That Ended Racial Segregation. Albany: State University of New York Press, 1997. Rosenberg, Jonathan. Kennedy, Johnson, and the Quest for Justice: The Civil Rights Tapes. New York: Norton, 2003. Ogbar, Jeffrey Ogbonna Green. Black Power: Radical Politics and African American Identity. Baltimore: Johns Hopkins University Press, 2004. Walk a Mile in My Shoes: The 90-Year Journey of the NAACP. Videorecording. Co-executive producer/director, Gene A. Davis: co-produced by Gene Davis Group, Inc. & D.R. Lynes, Inc. Morris Plains, NJ: Lucerne Media, 2000. Thurgood Marshall: Portrait of an American Hero. Videorecording. Columbia Video Productions. Alexandria, VA: PBS Video, 1985.